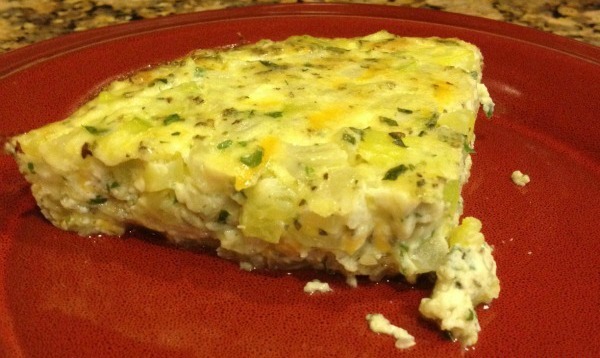 This Italian Zucchini Bake is delicious guilt free eating. You won’t find any flour, bread or a lot of carbs in this delicious dish! Meanwhile, chop the basil and parsley (I just threw it all in a food processor and chopped it that way. When the zucchini mixture is done cooking, remove it from the heat. Whisk the egg, basil, parsley, marjoram, Parmesan cheese and salt together in a large mixing bowl. After mixing well, add the zucchini mixture and the Monterey Jack Cheese. Mix well. Add the mixture to a greased 1½ quart baking dish and bake at 350 for 30-35 minutes or until a knife inserted into the center comes out clean. Once done baking, let the casserole sit for 5 minutes before serving. Looking for more Low Carb dishes? Check out my Low Carb recipe page! It was so so good, Terry! As my zucchini take over the garden, I'll be needing lots of ways to cook it. This recipe will be a perfect addition to my files. You won't be dissapointed with this recipe. It's a versatile meal – it can be served for breakfast, lunch or dinner! It looks great! So yummy. Thanks for sharing at the All Star Block Party. Julie, this is the kind of dish, we like in our house. I forgot to get zucchini today but, it is worth the trip, to pick it up tomorrow. If I get to make it, I will let you know. I am glad you added this to the Recipe Box so I could find it. I made this, for dinner, tonight but I subbed in cauliflower since I had no zucchini. It worked beautifully. Now, I have to make it with the zucchini to see what it should be like. Thanks for sharing. http://bookcasefoodie.wordpress.com/2012/06/29/italian-cauliflower-bake/ Please visit your recipe or at least, my adaptation. I am coming back for more recipes. We loved this one. We are all looking for ways to cook zucchini this time of year. this sounds like homey comfort food. I would love if you would share it on my foodie friday party today. I would love to share it on your foodie party! Thank you for the invite. :) Have a fabulous Friday! It took me more time than I thought to finally make this and it was terrific. Thank for this recipe. I am posting it in My Sweet and Savory, in a few minutes. I invite you to visit. I think, I didn't cook it long enough because it was not firm but it did not make a difference. It was cooked through and so yummy. You're welcome, Chaya! I am glad you enjoyed it. I had the same problem as well – the original recipe off of All Recipes said to only cook for 20-25 minutes. It definitely wasn't done in that amount of time so I left it in for about 35. Looking forward to reading your post about it!